Projects Abroad offers a programme in Disaster Management in Jamaica , which gives volunteers the opportunity to work directly with communities during the hurricane season each year. Hannah Payne, Kirsti Johnson and Fionne Marshall, all recent geography graduates, have been working at the St. Elizabeth Parish Council with the Disaster Management team. 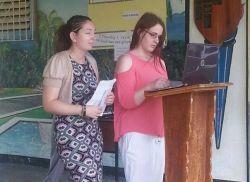 Their main role is to work with the staff at the parish council and provide technical support where needed. The volunteers travel with their supervisor to conduct shelter and community inspections to ensure that they are in a state of readiness. Where there is need for improvement, recommendations are made and the communities are charged to make the necessary changes, be it drain cleaning or cutting down overgrown trees. One of their main activities has been a visit to the Black River High School in St. Elizabeth where they did a presentation on the role children play in preparing for a hurricane. Kirtsi Johnson highlighted the fact that even though a disaster has risks to children, there are still things that they can do to help their parents in the event of a hurricane. The workshop was well received and the children all benefited from the presentation. Volunteers who join this programme are often graduates in related areas or are sometimes professionals or experts in the area of Disaster Management or Urban and Town Planning. They work either in the parish of Manchester or St. Elizabeth with the local parish councils, providing technical support to these government agencies. Owing to Jamaica’s location in the hurricane belt it is prone to natural disasters, which affect not only the residents of these parishes, but the country at large. The hurricane season begins in June and ends in November and during this time of the year emergency response teams and organisations, as well as the local parish councils, increase their disaster preparedness campaigns. Our volunteers have been making great strides in this area as they help to educate individuals on the importance of disaster preparedness and the adverse effects of climate change. The Disaster Management volunteers are doing a great job and local communities continue to benefit from their knowledge and expertise.